I’m totally swooning over this gorgeous Pumpkin Harvest Brunch created by Vicky from The City Cradle! Bundt cakes hanging from the trees, pancakes served in carved-out pumpkins (LOVE! ), water bottles adorned in lace… what a sweet way to celebrate the season with loved ones. 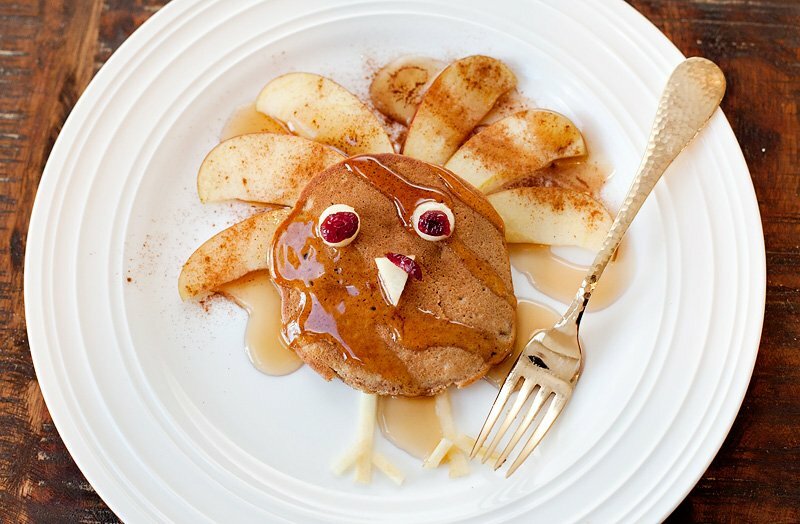 This would make for a beautiful Thanksgiving dinner table too… just swap out the pancakes for a starter like pumpkin soup! 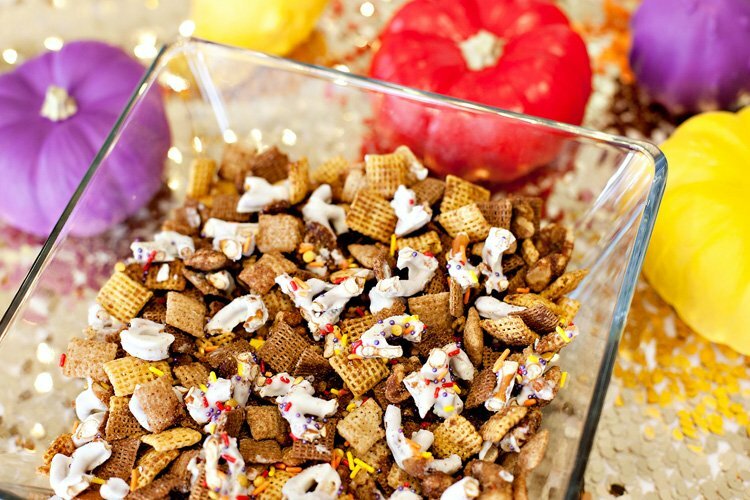 “I recently hosted a sweet fall harvest brunch that was chock full of handcrafted details. It was a lovely morning to celebrate love and soak in the first morning rays of the fall season. Using a coffee table, floor cushions and felt blankets, we were nice and cozy for breakfast! The pancakes took on a fall vibe when stacked inside small hollowed-out pumpkins and topped with a heart made from stiffened embroidery thread. Vintage mint serveware added a fresh touch to the warm colors of a harvest gathering. Along with the pancakes, hard boiled eggs, and fruit, we also served various flavors of bundt cake for a sweet treat. The cakes were suspended on top of upside down hat boxes throughout the tree branches. I have seen so many swings lately that I love, so hanging food with rope seemed like a fun take on that trend. They made such a beautiful display before we cut them down to enjoy! A homemade crocheted heart doile table runner lined the center of the table. This was a simple project made by cutting out craft store dollies and hand stitching them together. I also covered water bottles in lace to tailor them to the the party theme. My favorite part of this brunch was the pumpkin mojito bar! 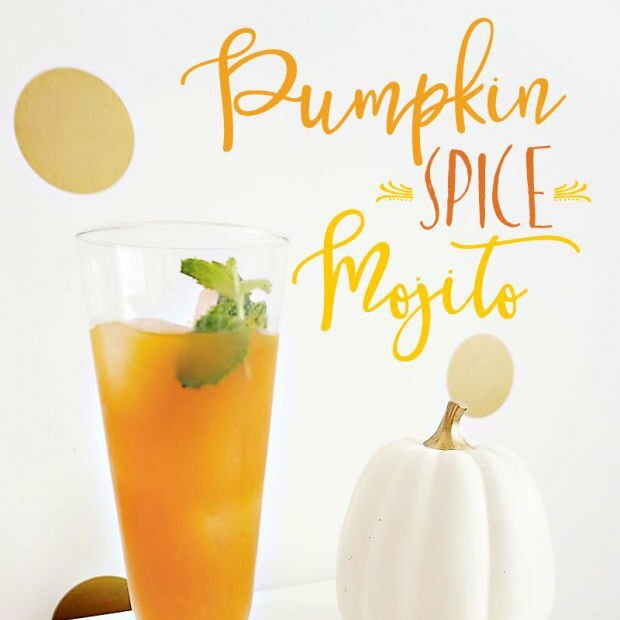 I set up a wicker side table underneath a lime tree in the garden to create the bar.” Get all the details on the pumpkin mojito bar right here. Yummy! Oh, and I love the new blog layout! A-Mazing! that excitement is for 2 things. 1. 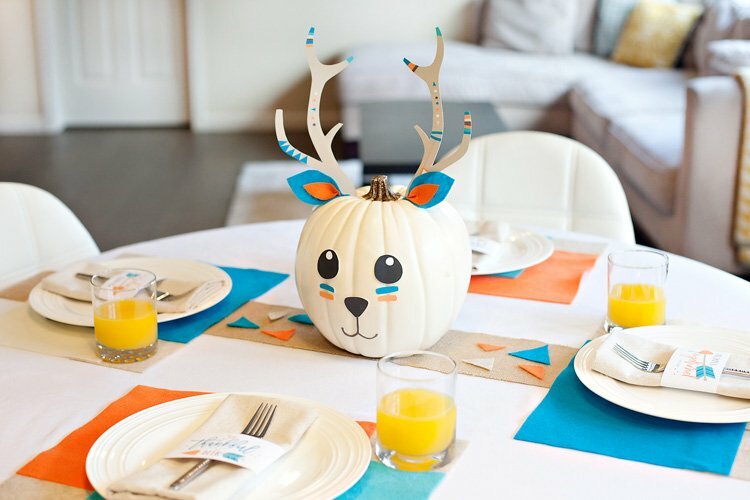 Cutest Pumpkin Brunch I have EVER seen. 2. NEW LAYOUT!!! AAAAH!!!!! Amazing Jenn!!!!!!!!!!!! I <3 <3 <3 your revamp… CUTE!!!! This is adorable. But I have to know where that coffee table is from. I have been searching for one just like it. Anyone??? love the new blog design Jen!!!! I love this! The new layout is fantastic, very easy to navigate! I especially like that new picture scroll menu. This is adorable! I’d love to do this myself! This party is amazing! What a creative way to display food! The shade of green used in this party is what I’m thinking about using for an upcoming party…so this will definitely get filed in with the inspiration!